Finally, a “how to” book for music teachers. New to Teaching music and Struggling to get your room set up? Frustrated after a year of trial and error? Starting to burn out and need some new ideas to infuse excitement into your programs? Look no further! Help is on the way! Did you know that 3 out of 5 teachers quit during their first five years of teaching? Why? They feel disconnected and under-supported. 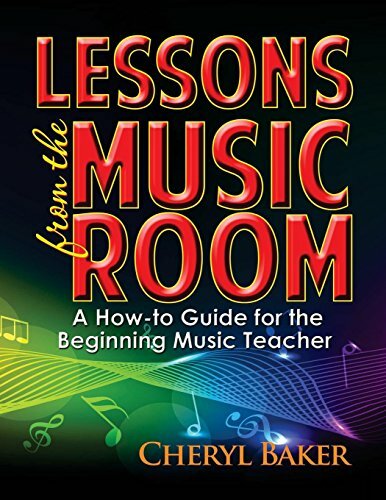 Lessons from the Music Room provides both support AND connection for the new (and veteran) music teacher. Discover the secrets to teaching music that your professors left out! It’s like you are sitting down with your mentor teacher sharing time saving tips and useful ideas. An incredibly valuable resource for all music teachers! Unlock the secrets to becoming a super-star teacher! Even if you’ve been teaching for a while, there are strategies for the experienced teacher that will transform your music program at your school! The students will love you! Your administrator will beam! Your parents will give you rave reviews! With 28 years of classroom tested experience, these gems of advice and proven strategies, will prepare you to hit the ground running on the first day of school! If you have any questions about this product by Made For Success Publishing, contact us by completing and submitting the form below. If you are looking for a specif part number, please include it with your message.